When you sign up for telecom services — some combination of TV, broadband, and/or phone — from your cable company, you’re told you’ll pay something like $49 or $99 a month… and yet the price you actually pay can be as much as 40% or more on top of that, thanks to a heap of sometimes confusing charges and fees. Which ones should you blame the government for, and which are made up by your cable company? One cable company at a time, we’ve been using real customers’ bills to break it down. In previous installations we’ve gone through Comcast, DirecTV, Charter, TWC, and FiOS; now, it’s AT&T’s turn. The below bill was provided to Consumerist by a real-life AT&T U-verse customer who subscribes to a triple-play TV, broadband, and phone package for a bundle rate of approximately $160 per month. Once you go through their total bill to subtract the promotional discounts but add in the various various taxes, surcharges, and fees this customer pays, however, you get to a total of $191.05. Of that bill, $31.05 — a little more than 16% — comes from add-ons outside of the stated package price. For whatever reason, AT&T lists its modem/gateway rental fee as separate and apart from its internet service and leads off the bill with it, even though other necessary equipment (like TV receivers) is listed under the appropriate service. So this is the subscriber’s modem/gateway rental fee for broadband access. Until 2015, AT&T did allow customers to purchase the gateway outright for a one-time $100 fee and avoid future monthly rental charges; however, it no longer offers that option. Physical equipment you rent is often subject to state sales tax, and sometimes county or city taxes too — all depending on where you live. For this consumer, it’s both; AT&T separates the jurisdictions into two separate line items. This is the fee AT&T charges for your set-top box. When the FCC says American consumers are paying $20 billion a year in cable box rental fees, these are exactly the kind of fees they mean. However, as part of their bundle this particular customer also receives a discount on their set-top box, and so the “promotional offer” line-item zeroes that one out again. The Broadcast TV Surcharge has become a favorite way for cable providers to increase your bills without just outright increasing your TV or bundle package price. Nearly all the pay-TV providers we’ve looked at are charging some version of this fee. Theoretically this fee exists to offset the costs of negotiating carriage rights with broadcast operators in your local area. More practically, it’s a way to pass those costs through to you without cutting into the profit AT&T makes from your bundle price, which nominally includes the price of programming. The FCC collects annual fees from telcos and cable operators; that’s part of where the commission gets its operating budget from. The FCC rules permit — but do not require — cable and telecom operators to recover the regulatory fees from subscribers in monthly installments. Technically speaking, AT&T, or anyone else, could pay this fee without passing it through to consumers. That said, every company whose bills we’ve broken down has passed this fee directly through to consumers. AT&T separates out the fees it pays to the FCC as a provider of IP TV services and the fees it pays as a provider of voice services (see #20 below). Cable franchise agreements vary widely from state to state or even from city to city, depending how old they are. What nearly all of them have in common is that the entity granted the franchise (in this case, AT&T) must pay the entity granting the franchise (the state government, local government, or utility board) a fee, typically around 5% of revenues gained from each customer. This subscriber’s state uses the language that the video franchisee “may identify and collect” the amounts for any state fees, including franchise and PEG fees, as separate line-items on subscribers’ bills. Ah yes, our old friend, state and local sales tax: one of the rare certainties in life. Rates vary wildly depending where you live but the vast majority of jurisdictions in the U.S. impose some kind of communications sales tax on pay-TV services. Not pictured: Pay-per-view programming, additional premium channels, PEG fees, or other various local video charges, as applicable, would appear in this section of the bill. This charge is in the unusual position of being both required by law and also (soon-to-be) unlawful! It also has a short shelf-life remaining. To explain: In 1998, Congress passed the Internet Tax Freedom Act, a bill that made it unlawful for states to charge communications access taxes on internet service. That law was renewed every three years until February, 2016, when it finally became permanent law. But there was a catch to the ITFA: any state that started charging its tax before 1998 was grandfathered in, and allowed to keep charging it. At the time the Permanent Internet Tax Freedom Act was signed into law, seven states were still holding on to their grandfathered-in internet taxes; this subscriber’s state is indeed one of them. However, the permanent version of the Act contains a sunset clause for all those grandfathered-in charges, and this state as well as the other six will all have to stop collecting this tax by June 30, 2020. Not pictured: Data overage fees. AT&T U-verse customers in this tier are currently subject to a data cap of 250 GB per month, after which AT&T charges $10 for each 50 GB. Those tiers and rates will change in mid-May. The Universal Service Fund is paid into by telecom operators, who are permitted — but not obligated — to recoup that cost from consumers. That said, basically everyone does push this through as a separate line-item. The FCC rules permit — but do not require — cable and telecom operators to recover the regulatory fees from subscribers in monthly installments. Technically speaking, AT&T, or anyone else, could pay this fee without passing it through to consumers. That said, literally every company whose bills we’ve seen passes this fee directly through to consumers. AT&T separates out the fees it pays to the FCC as a provider of IP TV services (#9) and the fees it pays as a provider of voice services. This is the state version of #19, above. This subscriber’s state also has a universal service fund, and it is subject to the same “may identify and collect as a line-item” law that other fees in this state, like the franchise fee (#10) are subject to. This fee is assessed by this subscriber’s state basically to pay for right-of-way access and similar charges. (See also #23.) If it seems weird to have both, it’s worth remembering that this state, like dozens of others, has been transitioning from local franchise control to state franchise control over recent years. Not pictured: Other voice fees, such as for services used but not included in a bundle; for call time in excess of the monthly minute allotment; for international long-distance calls, and so on. 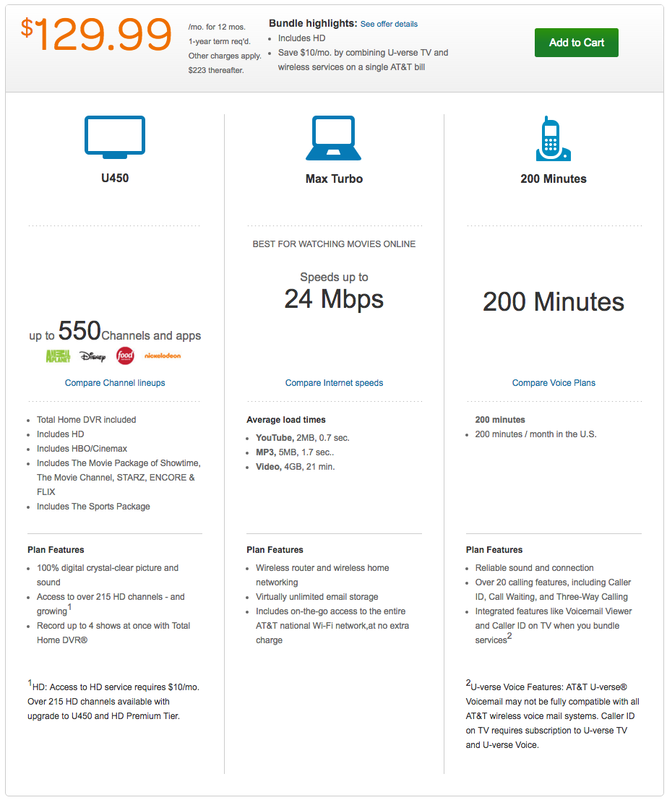 AT&T not your cable/Internet/phone provider? Don’t panic! Previous episodes of this series have covered Comcast, DirecTV, Charter, TWC, and Verizon FiOS.